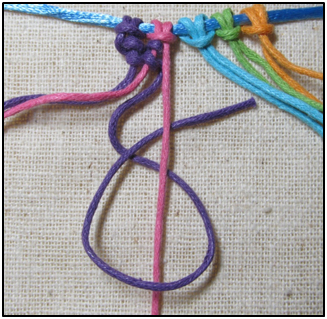 This is worked somewhat differently from the other half hitch knots. 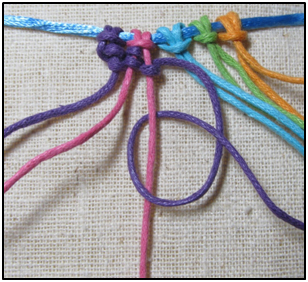 With this one you will take what is typically the holding cord and use it as the knotting cord throughout. 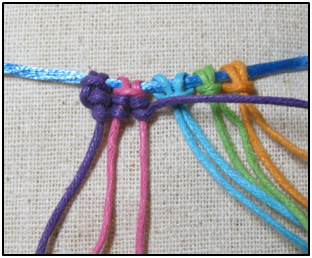 If you are planning to use this knot you will want to have a much longer cord to use for the knotting cord. 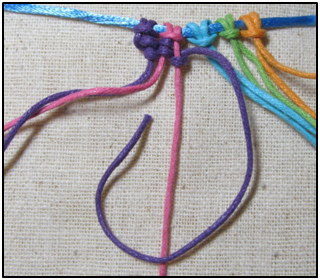 I have already started this one so that you can see the pattern, and also because the purple cord is more visible on the pink than on itself. 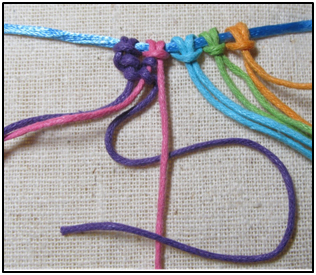 To start pick up the outer most cord and knot it onto the adjacent cord. It will go under the cord, then back over top of it. 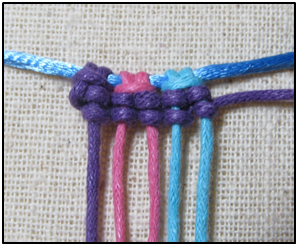 Note the loop or opening (made by the purple cord) on the left of the pink cord. This is where you will go through, and under. Often people use a pin here to hold it open. then under it and through.